European heavy/stoner/doom gathering Desertfest Belgium have announced the latest bands to be added to the 2015 bill: France’s finest heavy psych trio MARS RED SKY, San Diego’s cosmic jammers HARSH TOKE, some straightforward rock’n’roll with Eindhoven’s BLACK-BONE, and last but not least, German prog noise duo VANDAL X. Antwerp is set to be borne away by a whirl of fuzz-drenched rock and psychedelia in October! 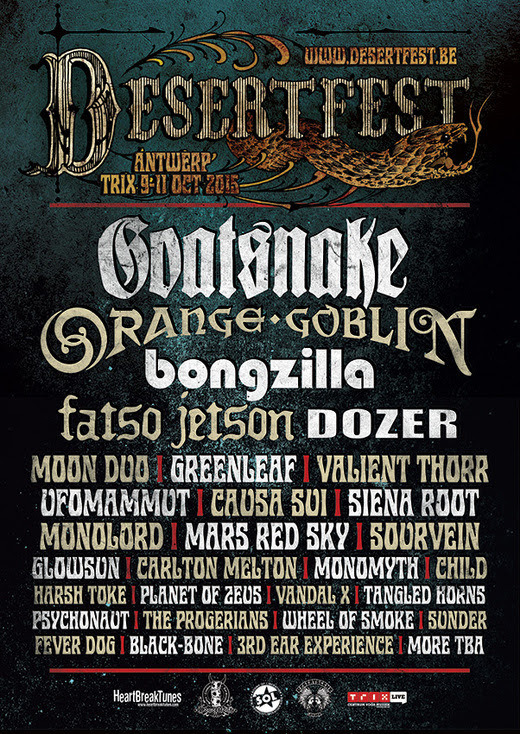 Goatsnake, Orange Goblin, Bongzilla Fatso Jetson, Dozer, Moon Duo, Greenleaf, Valient Thorr, Ufomammut, Causa Sui, Siena Root, Monolord, Mars Red Sky, Sourvein, Glowsun, Carlton Melton, Monomyth, Child, Harsh Toke, Planet Of Zeus, Vandal X, Tangled Horns, Psychonaut, The Progerians, Wheel Of Smoke, Sunder, Fever Dog, Black-Bone and 3rd Ear Experience. On the other hand, we are sorry to announce the cancellation of Philly’s psych act Ruby The Hatchet, who won’t be touring Europe this fall due to personal reasons.